Some friends and I walked around 7 miles in the Autumn fog and sunshine from Leyton to the Tottenham Hale. 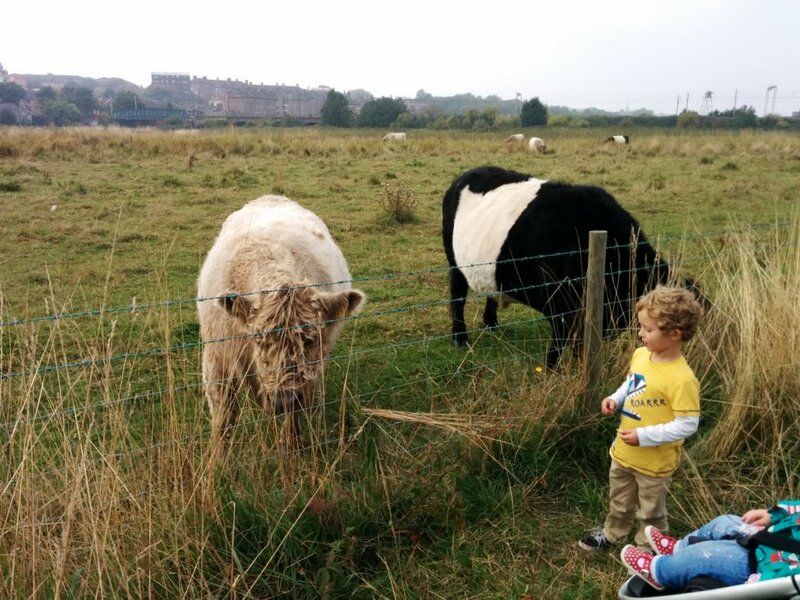 The route took in marshes, cows, defunct filter beds, monumental art, canals, tree climbing and parks, ending up with us marking the beginning of October with a seasonal pumpkin ale at the Beavertown Brewery. Starting off in seriously industrial Leyton, the walk took us past ex-Olympic 2012 carparks; now partly overgrown and partly turfed over. It was still foggy as we crossed Hackney Marshes and into the first bit of urban woodland. At the north-west tip of Hackney Marshes are the Middlesex filter beds; now a nature 10 acre reserve sitting between the River Lea and the River Lea Navigation (canal). Throughout the 18C and into the 19C, the area was occupied by watermills making the most of the fast-flowing river Lea. They went from grinding flour to powering lathes for sharpening the points of pins and needles. The filter beds were built on the site in the 1850s as part of a campaign to provide clean water for Londoners after the 1852 Cholera outbreak (the worst London had ever seen). The filter beds closed in the 60s and the machinery and stonework built by the East London Waterworks Company has been left in situ for nature to reclaim. 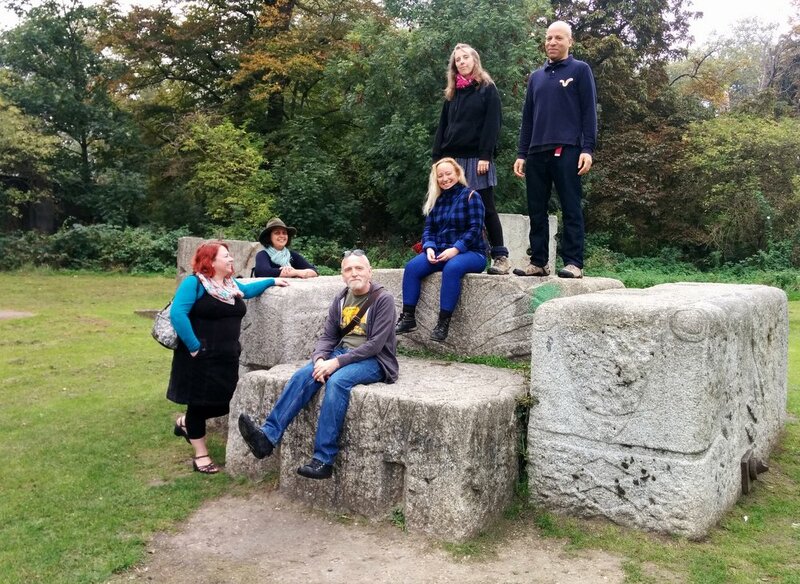 Standing on the centre piece of ‘Nature’s Throne’ (known locally as ‘Hackney Henge’), an artwork by Paula Haughney created from reclaimed granite blocks that used to belong to an engine house. The walk then went through Millfields Park and into Walthamstow Marshes. At the south-western corner is a cattle enclosure (!). The enclosure is a conservation area with the cows being used to provide ideal growing conditions for the Creeping Marshwort. This plant grows at the edge of grazed ditches and is only found here and in two other sites in England. Their field also contains Bomb Crater pond, a hole left by the explosion of a German V2 missile on Sunday 11th February 1945. 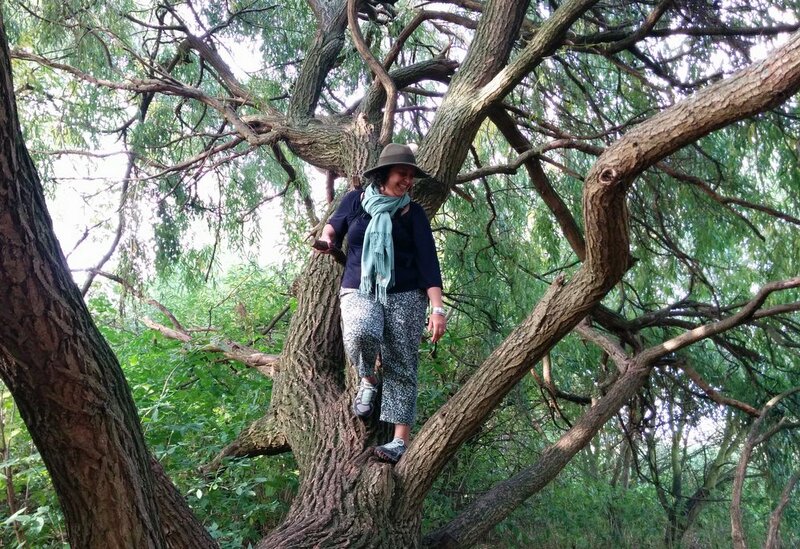 Just before Coppermill Lane are two excellent climbing trees. Leaving Walthamstow Marshes, we continued along the River Lea through Springfield and Markfield parks. The sun was out so we sat outside to drink our Stingy Jack (containing flaked oats, cinnamon, nutmeg, cloves, pimento, crystallised ginger, Demerara sugar, cardamom, and roasted pumpkin). Yum!